How can I setup a calendar account? 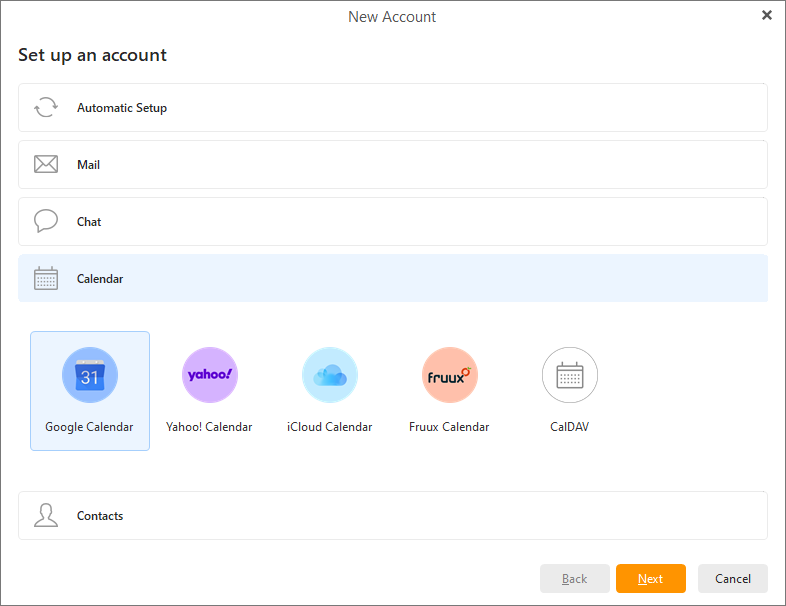 If you want to set up just a separate calendar account or your available calendar account could not be found using the Automatic setup, you can definitely set it up manually. First of all, go to Menu > Tools > Accounts, and click on the + button. Skip the Automatic setup and click the Calendar section instead. Select the option that applies to your existing Calendar account and click Next to finish the setup. Note: If you don't have an online calendar account but would want to have one to synchronize your calendar online to your other devices, you can register an account for free on some of these services - for example, Fruux provides a free option to synchronize just your Calendars and Contacts.